Traditional disaster recovery solutions are expensive and complex. That’s making disaster recovery in the cloud a compelling alternative for many small-to-mid sized companies. Cloud solutions are more affordable, require less commitment, and offer more capacity—an ideal combination for resource-strapped organizations. VMware vCloud® Air™ Disaster Recovery is easy to deploy and offers flexible terms and scalable resource options. It enables you to improve upon your existing disaster recovery plans—or put a new plan into operation—with minimal cost and resources. 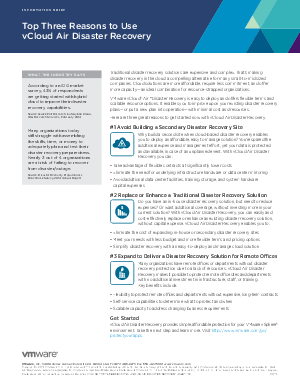 Here are three great reasons to get started now with vCloud Air Disaster Recovery.